The place is built of fragments. It is a dream that breaks up and re-emerges with vivid clarity. Pieces of wood twist and turn on themselves. They caress rocks in their folds. Passageways reveal windows of colored glass. Blues turn to reds, reds to greens and greens to purples. The light slips into the interiors and brings weight. They are made of slivers of a discarded world made whole again. It is the place known as Eliphante. More than three decades ago, husband and wife Michael Kahn and Leda Livant Kahn moved to Sedona. 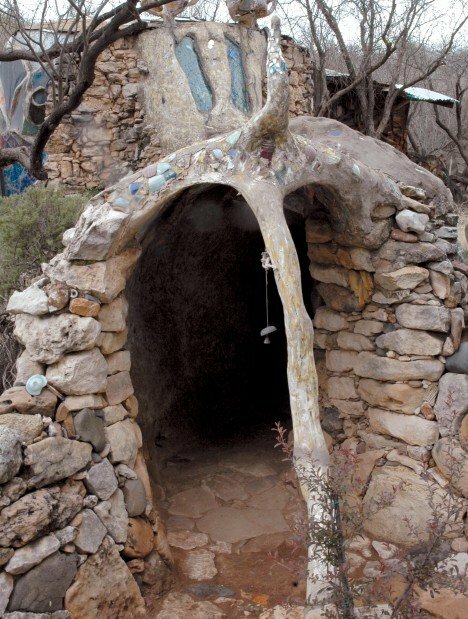 The two artists had little money and ended up living on a 3-acre plot of land on the banks of Oak Creek near the community of Cornville. Local rancher Bob Crozier owned the land, and he gave the couple permission to stay. However, the Kahns needed shelter. Soon, Michael began to build a home out of anything he could find -- from rocks on the property to discarded construction supplies, unused Astroturf and broken glass. The home flourished into a work of functional art later christened "Eliphante," the faux-French name invented by Crosier because the tunnel entrance looked like the trunk of an elephant. Kahn built other similar structures and artistic expressions on the property. This includes the Winter Palace, Pipedreams and Hipodome. The property evolved into one beautiful jumble of an outdoor art installation. Work might have continued, but Kahn passed away in late 2007 from a rare neurodegenerative illness known as Pick's Disease. The disease of the brain affects decision-making and can cause a loss of vocabulary. Shortly before his death, Kahn could speak only four words: maybe, just, right and good. Any combination of those words could be used in describing Eliphante. It is a work that, with its creator's death, has found a kind of completion. A few months after Kahn's passing, the New York Times ran an article on it. It drew interest both for its artistic expression and for the notes of sustainability that come from the creation of the buildings from recycled material. "Michael was always ahead of the curve -- or behind it," Livant Kahn quipped in a 2009 interview for Northern Arizona's Mountain Living Magazine. "We weren't doing it to save the planet. We just wanted a place to live. It just was necessity." During a tour a number of months ago, I joined a woman named J.D. Allen, who had included visits to Eliphante on her list of Sedona-area excursions through her business Blue Feather Tours. In recent months, a reconfiguration has led to tours only led by onsite managers. After crossing Oak Creek in a canoe to get to the isolated peninsula not far from Cornville Road, we stepped past an outdoor sculpture that looked like a miniaturized amphitheater. 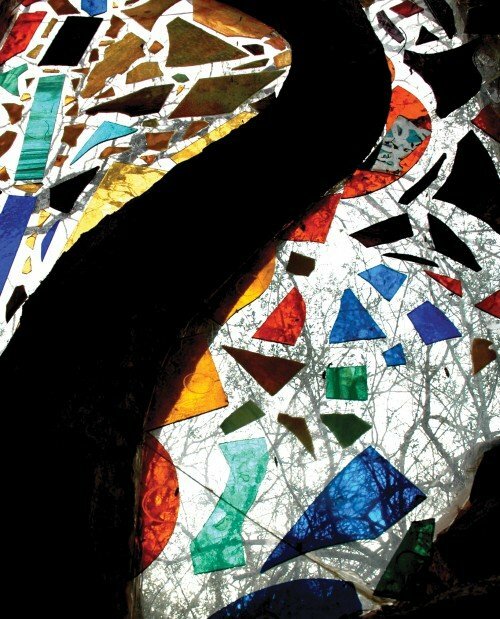 We walked around a series of wooden sculptures painted in a mosaic style. The whole time, I stared down at the Astroturf that covered the place. "Someone offered Michael Astroturf and he said no," Allen said. "He didn't want it. And then he changed his mind, decided that it was a good idea. A couple of days later he said, 'yes.' They brought five truckloads. It took them almost two years to clean it and lay it down. It came from a golf course. It keeps the weeds down and makes it easier to walk around the property." After several minutes, we arrived at the entrance of the building that started it all. Standing to one side of the entrance, the building does appear as a fanciful elephant. A tunnel forms the trunk, which leads to the main dome that was originally intended to be the Kahns' home. "Shall we?" Allen said. She walked into the tunnel, but stopped to ring a bell that hung from a string near the entrance. "You have to ring the bell," she noted. We moved back through the tunnel, made with slight bends to it so as not to fully reveal what was ahead. We emerged from the tunnel and stepped into the dome of the main room -- its own kind of sensory experience. To the right, the wall is formed of fragments of carved lumber, tangles of driftwood, stone, a broken but reassembled mirror and the remains of an old piano. To the left, a work of stained glass, built into a snaky and organic framework made of carved wood. At the back of the room was a sunroom that extended out from the dome. And, above the entrance to the tunnel, a small loft with a bed. Kahn built Eliphante as a residence. A stove for heating and cooking and a small sink take up space at the center of the dome. Everything around it is a swirl of stonework, woodwork and glasswork. "They never lived in Eliphante, but that was the intent," Allen noted. Our second main stop on the tour was a building called "Pipedreams." The entrance appears like a place out of some surreal fantasy movie. The door is a wild assemblage of wood, both raw and painted, and it does not have a handle. It has only one special place to push that opens one side of the door before the other opens. The labyrinth of a structure was created as a gallery. Kahn designed it in a way where the viewer comes in close contact with his abstract paintings -- and so that no two paintings could be viewed at the same time. As an artist, Kahn put his passion for painting first. The work at Eliphante was a diverted path that he explored. Before the couple met, Livant Kahn fell in love with one of the paintings from a series called The Process, which hangs in its own corner of Pipedreams with a chair sat before it. She saw it in Provincetown, Mass. She met and fell in love with the artist shortly thereafter. Because of this, Allen likes to think Eliphante "all began as a love story." After we left Pipedreams, Allen and I toured the place known as the "Winter Palace," a one bedroom shelter Kahn built for himself and his wife. She asked that he build a place while they waited for him to finish Eliphante. We also checked out the outdoor kitchen, where Livant Kahn did most of the cooking; the gardens built in fiberglass boats to fend off the gophers; and a shelter that serves as an open-air gallery of sorts. From there, we walked to the third of the three significant structures. Known as the "Hipodome," the construction and design is much like Eliphante. Livant Kahn greeted us at the door. Alna Laurel also joined us inside. Over green tea and danish during my visit, Livant Kahn talked about the spirit of Eliphante, in many ways a thriving testament to her husband's life and a world of artistic homes that today would be considered sustainable -- recycled and local materials, solar-heated water and designs that utilize the environment. But, Kahn did not do it to be trendy. "We were penniless and we scrounged for everything that we could find to build Eliphante," Livante Kahn said. "This included lumber yards, where they had broken bags of cement we could buy for cheap ... And the Village of Oak Creek was in the process of being built at that time, and so there was a lot of construction going on. We got to know the folks who needed to burn the leftover stuff and we'd find out what we could take. We had a big truck at the time and we'd load it up." After nearly an hour talking at Livant Kahn's table, she offered a final reflection on the place. "I complained a lot while we did it, but I am so glad we did it. Mostly, I'm glad because of the thousands of visitors ... And I'd say 90 percent of the people who come here have positive reactions. Some just find it inspirational." She looked down at her tea and nodded. "I miss Michael. I have joy and sadness looking around, but the joy is predominant. I see him here in everything." Livant Kahn, now 83, has since left Eliphante behind, turning it over to Laurel and others to oversee and develop as both an attraction and a place to celebrate community and sustainability. By the summer of 2009, Livant Kahn found a cozy apartment in Santa Fe, near the home of her son. In a recent interview, Laurel said that work continues to purchase the property, which the organization overseeing Eliphante is raising money to obtain. "When the original plot of land has been attained, we intend to expand into neighboring plots and create an 'ecovillage' complete with sustainable gardening and self-supporting personal businesses. There we intend to teach and demonstrate various forms of green building styles." This move toward making Eliphante a place for positive change still keeps in mind the art and whimsy of the installation. The hope is to further stabilize the building and expand outreach to make more people aware of the surreal place. In reflecting on moments at Eliphante, I remember being lost in the maze of Pipedreams. I became drawn into the hidden forms on large canvasses and other places hidden by sheets of fabric. I felt as if I wandered through the mind of the artist himself. This feeling reached a crescendo as I moved past rich mosaic walls and found my way to the exit. There, I saw one of the last words Michael would ever come to say carved into the door.